What makes a fabulous holiday for your whole family? The chance to relax and recharge; to do something exciting and new; the opportunity for every member of the family - from teens to toddlers - to build a memory bank of laughter, activities and shared experiences that bonds your family, so when you're back on the work commute or trudge to school you have those fun memories to sustain you - until the next holiday. A holiday on board a cruise ship offers something for everyone - poolside lounging and romantic dinners for adults, adrenaline-packed activities for kids like learning to surf above the sea (how cool is that?) or rock climbing, and of course a choice of pools to play in. A huge plus point is enjoying each other's company but without having to compromise on what everyone wants to do. Plus everything you need to enjoy your holiday (bar any added extras like spa treatments and speciality dining) is included in the price; truly amazing value. One of the best things about a cruise holiday is that the amazing destinations come to you: no worrying about flight connections; no exhausting driving; no suitcase-lugging and unpacking and re-packing for the next leg of your trip. From the moment you step onboard your ship at Southampton or from a European port, you're on holiday. Royal Caribbean offers destination itineraries to suit everyone. For example, from Southampton you could take the 14 Night Mediterranean Explorer, taking in the sights of Gibraltar, Barcelona, Nice, Rome, Málaga and Seville or the 12 Night Northern Delights, visiting Oslo, Copenhagen, St. Petersburg, Helsinki and Bruges. And from Europe, you could set sail for six nights from Venice, around the coast of Croatia to Greece, or from Rome on the 9 Night Greek Isles cruise, taking in Sicily, Mykonos, Santorini, Athens and Capri. There are 25 cruise ships to choose from in Royal Caribbean's spectacular fleet, all offering thrilling activities, a choice of dining experiences, award-winning clubs for kids and teens and entertainment for all the family. One evening you could take in a glamorous West End show like Mamma Mia and the next night be gasping in awe at the high diving acrobatics, trampolining and lightshows that make AquaTheatre a must-see. Plus, there are comedy shows, live music and ice skating shows and the latest 3D blockbusters to see, indoors or on deck. All of this is included in the price so your only worry is how you're going to fit it all in. As much as we love spending time with our children, it's lovely to have occasional me-time for relaxation. For parents who want the chance to kick back and relax with a spa treatment or poolside tan top-up there is the award winningAdventure Ocean® programme that caters for children of all ages, from babies to teens. Royal Caribbean also offers a babysitting service for children aged over 12 months on all cruises (at additional cost), while you enjoy the chance of a romantic dinner a deux. It's easy to see why Royal Caribbean's ship, Independence of the Seas, was voted the number one cruise ship for families in the 2015 Cruise Critic Cruisers Choice Awards. This summer both she and her sister ship, Navigator of the Seas, will be setting sail from easy-to-access Southampton to a host of exciting destinations - book your Royal Caribbean cruise now and make 2017 a year to remember. Book through royalcaribbean.co.uk or on 0844 493 4005 and pay no credit card fees. Buy one cruise fare, and get one half price on selected 2017 sailings. Plus get 50% off kids' cruise fares and reduced deposit of only £25pp. PLUS enjoy a deluxe drinks package including cocktails when you book selected 2017 sailings from the UK and Europe. Book by 6 March. Terms and conditions apply. Relax on the beautiful beach at Santa Cruz before heading into the city to explore. Walk from the bustling streets of Barcelona into the tranquillity and awe-inspiring architecture of the Palau de la Música Catalana. 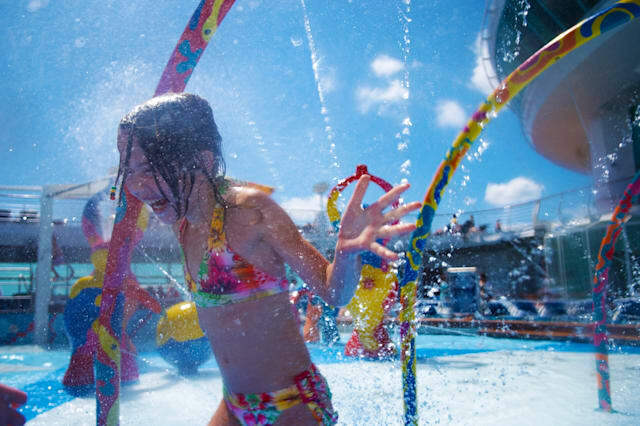 Relax poolside with the wonderful sound of your children's laughter as they make new friends playing in the watery H2O Zone paradise onboard the Independence of the Seas. After exploring Nerja's spectacular caves, lie back on the beach, listening to waves lapping, people-watching before being enticed by mouth-watering cooking scent to one of the waterfront restaurants. It’s an amazing feeling, learning to surf. The surge of the swell below, feet firmly anchored, totally at one with the waves and all while you’re cruising the off the coast of Gibraltar, where the Atlantic and Mediterranean meet. With the exhilarating FlowRider on the Navigator of the Seas, you can catch a wave anytime, anyplace. The wind in your hair, the sun on your face, the taste of salt on your lips, the stunning white and blue roofs of Santorini gleaming bright in the distance. This is a pure adrenaline rush. And you haven’t even got to the paragliding yet. There's nothing quite like the exhilaration of swimming in the famous falls at Croatia’s Krka National Park. The thundering sound of the waterfalls and the excitement of jumping into cool, clear water.